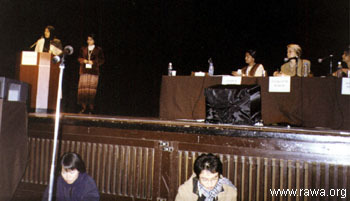 From December 7-13, 2000, Saba Sehar an activist of RAWA and Maryam a suffering Afghan woman introduced by RAWA attended "Women's International War Crimes Tribunal" in Tokyo, Japan. 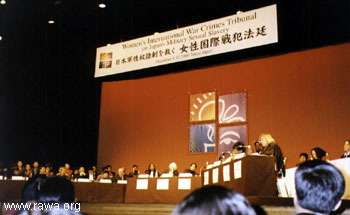 The tribunal was organized by Women's Caucus for Gender Justice. Maryam from Afghanistan and some other women from Bangladesh, Chiapas, Algeria, Burma, Somalia, Sierra Leone, Rwanda, E.Timor, Guatemala, Okinawa, Vietnam, Burundi, Kosovo etc. presented their testimonies. Also Maryam and Saba attended some other events organized by RAWA supporters in Japan and gave interviews with some major Japanese media. Click here for a report of their visit published in The Daily Yomiuri (Japan). Maryam a bereaved Afghan woman gives testimony in the "Public Hearing on Crimes Against Women in Recent Wars and Conflicts" in Tokyo. 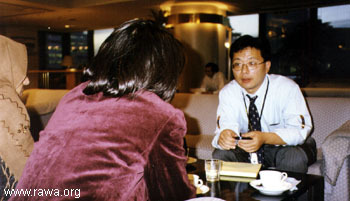 Saba is being interviewed by a Japanese journalist. 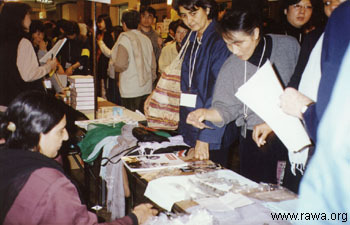 Saba and Maryam talking about human rights tragedy in Afghanistan to a group of concerned Japanese.